ChipNation is simultaneously a tempting and daunting prospect. Infinitely customisable chips — what exactly does that mean? Well, good news if you crave sweet potato fries with harissa spice, sate sauce and vegan bacon bits — you can have that here. Apparently there are over 4,000 combinations you can put together on the menu, so it's best to just let your creative side do its thang. We try multiple combinations on our visit, deciding the truffle mayo is the definite standout. We also try a special combo made by the chef Neha, modestly dubbed Neha's Bum Burner. As you can imagine it's spicy (and this is after she dials it down a bit for us...), but it's also cheesy and astoundingly moreish. Many people will come here for one thing alone; Halloumi fries. 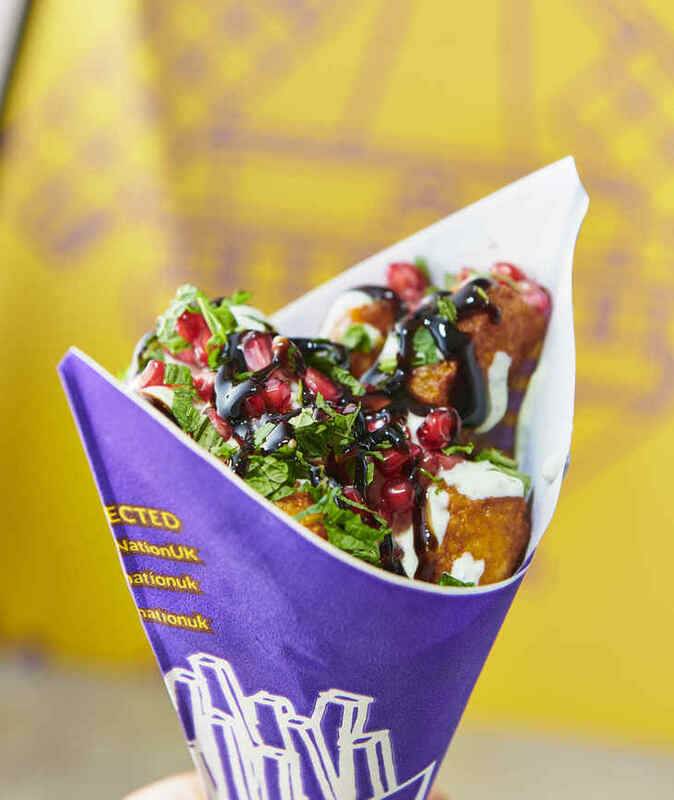 We try them with sumac spice, zatar mint sauce, balsamic glaze, fresh mint and pomegranate. We're still not 100% sold on the concept of Halloumi fries in general — we prefer our halloumi sliced and chucked on a BBQ, served with some lemon juice — but these are as decent as you're going to find anywhere in London. They're so gloriously thick, you exert extra effort just to chew through them. Not everything lives up to those high standards though. Chips and curry sauce, a chip shop classic, disappoints. There simply isn't enough sauce (to be fair, this is an anomaly among all the dishes we try). We suspect it's the fact that these are fries rather than proper British chips that prevents this dish from living up to the nostalgic memories we hold so dear. ChipNation is open until 1am on weekends, so while in the daytime the aim is to attract the Soho foodie types, in the evening it aims to get the tipsy Soho characters through the doors. 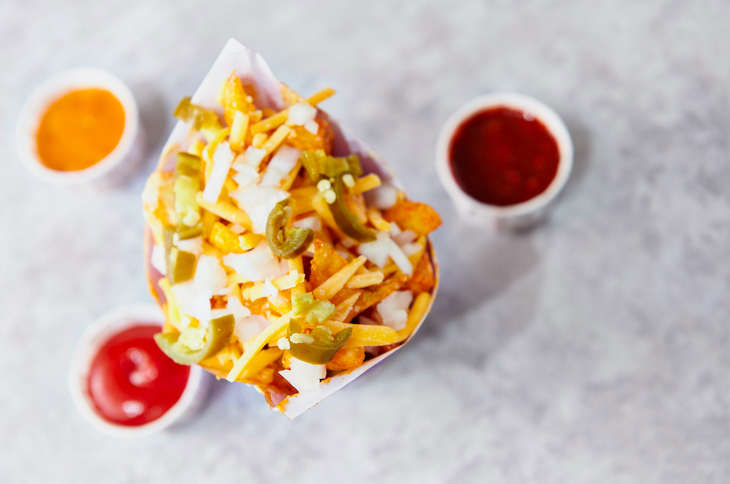 While chip-loving foodies will go gaga for ChipNation, those on a night out might be a bit bemused. They're not hunting quality food, they just want whatever's closest, easiest, and cheapest. This slightly muddled concept continues to the space it's in, which is too small — with six customers inside, it's crowded. Yes, this is a takeaway joint, but lots of the chips have dipping sauces that benefit from sitting down, and there are only four seats. There are also currently a few things missing from the menu. It could do with some preset combos, otherwise your average joe has no idea what to order. The staff are really helpful with their recommendations, and they told us they are going to address this. 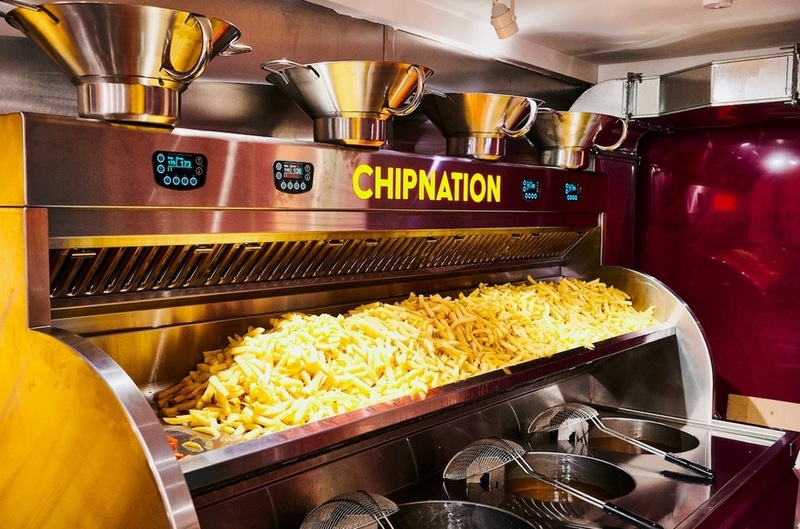 Another thing to bear in mind is that if you just want a large chips with ketchup — as many late night punters wandering Soho do — ChipNation's tiered system means that will cost you a whopping £6.50. If you're ordering such a bland combo, this isn't the place for you anyway, but it's still something to consider. Instead, come here if you're looking to go all Willy Wonka over your chips.